Abstract: Additional criminal damages in corruption are special provisions. This criminal type has a strategic meaning to return the corrupted money and give deterrent effect. In the judge's verdict it raises a problem. The problem: why is the judge in the criminal substitution of substitute money in the form of imprisonment tend to be varied and inconsistent in terms of the duration of his sentence. The purpose of the research to know and analyze the basis of judge consideration dropped subsidair criminal money in the form of prison penal which varied and inconsistent tends. The research was conducted by normative juridical method which relied on primary and secondary legal materials. Based on the results of the study concluded (1). The judge does not specifically discuss the criminal cost of substitute money or subsidair in the form of imprisonment. The verdict in the form of substantial money laundering is substituted for a relatively short prison sentence. So it does not cause deterrent effect. (2). The absence of a clear benchmark for the old criminal prison boundaries has resulted in a short decision and the occurrence of disparity. Suggestion, it is necessary to proportional comparison regulation between the amount of state compensation and the prison criminal subsidy.Keywords: Replacement Money, Subsidair Criminal Prison, Judge's Decision. Abstract: Every Environment Has Its Own Laws And Ethics Which Guide Behavior; However, It Does Not Mean That Anybody Is Able To Obey It And It Rises Three Consequences At Legal, Ethic And Social. This Research Is A Quantitative Research With Law In Action Approach, It Is A Non-Doctrinal And Empirical Social Science Study. Internet Brings The World To New Ways Of Thinking, And Communicating. Netiquette Is An Ethical Guide In Behaving / Communicating Among Netizens. Teachers’ Awareness To Communicate Well In Smk Bakti Purwokerto Is At A Poor Level. Bad Habits Communications In Real-World Are Brought Into Cyber Which Often Create Legal Issues. Although No One Has Proceeded To Justice, It Is Quite Worrying Since Their Position As Teachers Should Be Role Models For Their Students. It Is Necessary To Realize The Awareness Of Compliance With The Law And Ethics Of Cyber Communication For These Teachers.Keywords: Netiquette, Internet, Social Media, Law And Ethics, Communication. Abstract: Conserving environmental functions particular water resources conservation is a shared task between the government and the public so that the goal of environmental sustainability is achieved. The purpose of this paper to examine the effectiveness of Kuningan government policy in the conserving water resources. This study uses empirical juridical method with descriptive analysis. The data collection of primary data is done by observation, interviews to related institutions and secondary data is in the form of legislation and legal theories. This research takes place in Kuningan regency, West Java province. The data are analyzed to examine the effectiveness of Kuningan Government policies in water resource conservation. The results of the research Kuningan Government’s policy in Water Resources Conservation are Kuningan District Regulation Number 12 Year 2007 about the Conservation of Water Resources and Kuningan District Regulation Number 12 Year 2011 about the Implementation of Kuningan Botanical Gardens as other Regulations and Government policies in Kuningan Regency in water resources conservation has been already run effectivelly. It can be seen from the availability of sufficient regulations as well as community participation.Keywords: effectiveness, policy, water conservation AbstrakPelestarian fungsi lingkungan hidup khususnya konservasi sumber daya air merupakan tugas bersama antara pemerintah dan masyarakat sehingga tujuan kelestarian lingkungan hidup tercapai. Tujuan penulisan ini untuk mengetahui efektivitas kebijakan pemerintah daerah kabupaten kuningan dalam konservasi sumber daya air. Penelitian ini mengunakan metode penelitian yuridis empiris dengan deskriptif analisis. Pengumpulan data melaui data primer yaitu observasi,wawancara pada lembaga-lembaga tekait dan data sekunder yaitu peraturan perundang-undangan serta teori-teori hukum. Penelitian di Kabupaten Kuningan Provinsi Jawa Barat. Data dianalisis untuk mengetahui efektifitas kebijakan pemerintahan daerah kabupaten kuningan dalam konservasi sumber daya air. Hasil penelitian bahwa pemerintah daerah kuningan mempunyai Peraturan Daerah Kabupaten Kuningan Nomor 12 Tahun 2007 tentang Konservasi Sumber Daya Air dan Peraturan Daerah Kabupaten Kuningan Nomor 12 Tahun 2011 tentang Kebun Raya Kuningan serta peraturan lainnya dan Kebijakan pemerintah daerah kabupaten kuningan dalam konservasi sumber daya air sudah berjalan efektif yaitu bisa dilihat dari ketersediaan peraturan-peraturan serta partisipasi masyarakat.Kata kunci: efektivitas, kebijakan, konservasi sumber daya air. Abstract: Climate change issues for the last two decade already concern and influence every nation, because the impact to human living and other life form. This problem very complicated and cause by many aspect especially development activities, so the policy and regulation on every state to mitigate and adapt climate change will be the prior concern. Nowadays, International cooperation through the international convention related to climate change such as United Nations Framework Convention on Climate Change needed and also support by conference and meeting is one of effort for finding solution to solve that problem including from the law aspect. Indonesia as a developing country today, participate in every conference and already ratified the international convention and on process of implemented the international convention into national regulation. Energy as a resources, identified as one of many source that directly influence to global warming, as a part of environment, energy resilience needed to be support the Indonesia commitment to the international society.This paper will be describe law analytical description from the academic perspective in environmental law, with principle, norm and also implementation to analyze the main problem of climate change especially in Indonesia and opportunities and challenges for energy security . The recommendation of solution will analyze based of law research related to the topic with descriptive analytical methodology to describe comprehensive idea about the problem and solution in climate change issues and environmental law in Indonesia law system perspective. The law and regulation describe with normative, systematic conducted toward the related constitution and other regulation (national and international) to obtain the conclusion and recommendation for climate change issue and support sustainable development. Abstract: Principally, dispute settlement of estate distribution on Minangkabau People is done by deliberation. If its settlement through deliberation is failed, an effort to solve the dispute through court needs to be conducted. 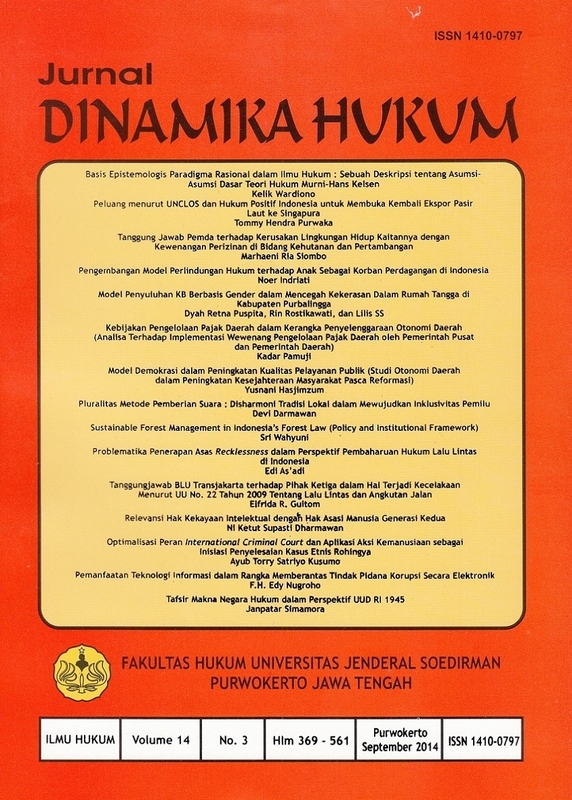 This paper studies first, how is the opinion of judicial institution in the dispute of estate distribution on Minangkabau people; second, how is the implication of estate distribution on Minangkabau people after judge’s verdict. This is normative research with statute approach and case approach. The result of this research shows that there is the possibility of judicial institution’s verdict in the dispute settlement of estate distribution which is contradicted with adat law of Minangkabau (Matrilineal kinship). However, if it is seen from the legal perspective, estate distribution of Minangkabau people after judge’s verdict can be a breakthrough that is able to change the value of old adat law into the new one. Keywords: Dispute settlement, estate distribution, matrilineal kinship.